Rubber Duckies are as popular as ever. 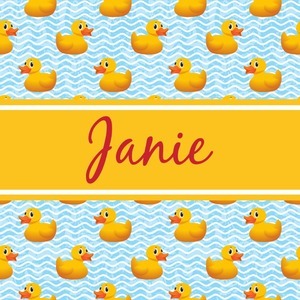 Our rubber duckie design features traditional yellow rubber duckies on a waves background. The duckies are floating around in water. Cute, adorable and simply precious are words that come to mind when looking at this design. We chose to use a thick yellow ribbon with a name on it in a scripty font in red.